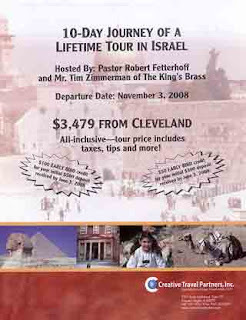 Bob Fetterhoff, pastor of the Grace Brethren Church in Wooster, Ohio, is leading a tour to Israel this fall. The 10-day trip departs from Cleveland on November 3. The trip begins in Tel Aviv and winds through Caesarea by the Sea, Nazareth, Capernaum, Qumran, Bethlehem, and many other sites. Among the many activities, tour guests will experience the Mt. of Beatitudes where Jesus gave the Sermon on the Mount, dine in a Bedouin tent, visit Yad Vashem (The Holocaust Museum) in Jerusalem, walk the 35-acre Temple Mount, and float in the Dead Sea. To see a complete itinerary, including reservation information, click here.